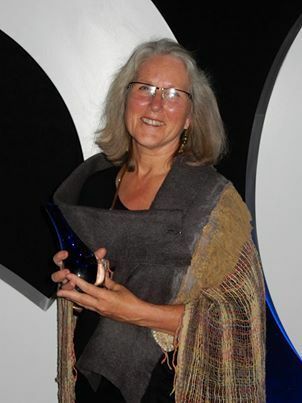 Gwen Parry, the worthy winner of the national Lut-Da Award, at the Australasian Quilt Convention Gala Dinner in Melbourne on Saturday. This annual award acknowledges an individual who has made an outstanding contribution to their community through quilting. Their work may have been to assist individuals or groups in need, or to develop programs to assist the general community, and must have utilised the medium of quilting. It is called Lut-Da after the aboriginal word meaning “to give”. As our Community Quilts Convenor, Gwen has more than fulfilled this criteria. Well done Gwen! This entry was posted in Community Quilts, Exhibitions and tagged AQC, Community Quilts. Bookmark the permalink.